Wallpaper with beautiful Black-naped Blue Flycatcher (Hypothymis azurea), perched on a nest like a shrike. 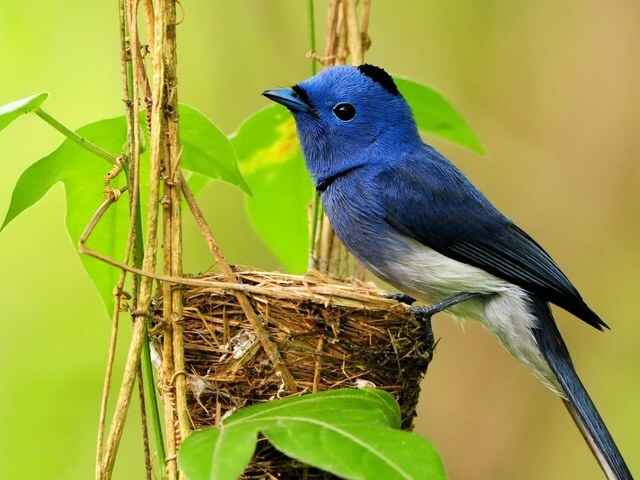 The blue flycatcher is an insectivorous passerine bird, belonging to the family of monarch flycatchers. Males have a distinctive black patch on the head and a narrow black 'necklace'. The Black-naped Monarch is widespread in thick forests of the tropical part of southern Asia, from India and Sri Lanka east to Indonesia and the Philippines.